So you do not like to read yet? Surely there are good books you will enjoy in the library. What are YOU interested in? Hunting? Skateboarding? Dating? Humorous or Scary? Extreme? Type one word in the library catalogue. Or try to type the words “reluctant” or “easy”. Scroll the list of results to find a book that you may like, open the record details and read the Subjects, Notes and keywords to decide if you will like it. 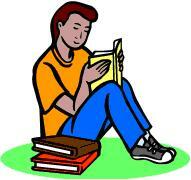 Find narrow books, or book published by Barrington Stoke. Look for large fonts and short chapters. Read the blurb on the back of the book. Open the book. Read one paragraph. If there are more than two words you do not read or know, then find an easier book. Browse the Graphic Novels and Breezy reads (picture books area). When you have chosen, always record your book at the issue desk. This is a great list! I’m always looking for new books for my son, he’s a fast reader! He loved The Hunger Games and the World of Adventure books. I would also recommend The Obsidian Pebble by RA Jones (http://www.rajonesauthor.com/); it’s also an exciting, interesting read that’s great for 9-10 year olds. Are E-books good for reading?